Variable products are a product type that lets you offer a set of variations on a product, with control over prices, stock, image and more for each variation. They can be used for a product like a napkins, table cloths, tables etc. where you can offer different sizes and different colors. To add a variable product, create a new product or edit an existing one. As a Vendor, Go to your Products page. Select the Add Product button or Edit an existing product. The Product Data displays. Select Variable product from the Product Data dropdown. In the Attributes section, add attributes before creating variations. 1. Select Custom product attribute, and Add. 4. Enable the Used for variations checkbox. 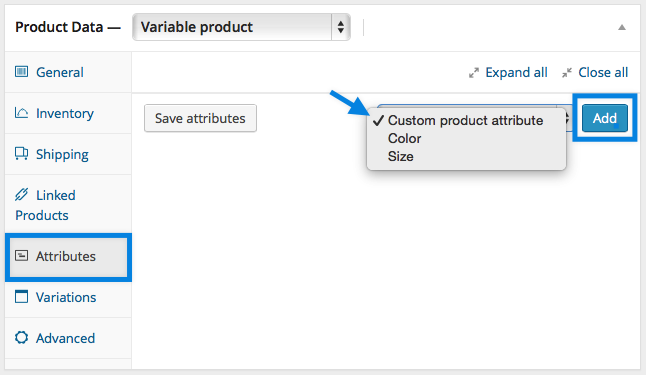 To add a variation, go to Variations section in the Product Data meta box. Select attributes for your variation. To change additional data, click the triangle icon to expand the variation. Edit any available data. The only required field is Regular Price. If you have more than 10 variations, use the buttons to navigate forward and backward through the list. Each time you navigate to a new set of variations, the previous set are saved. This ensures that all data is saved. We recommend setting defaults you prefer on variations. 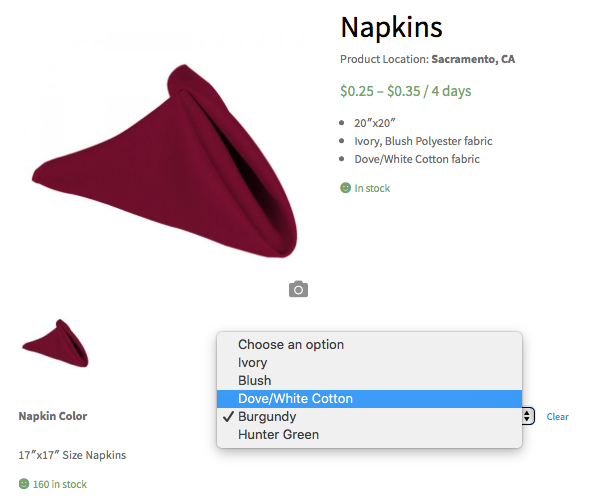 In the example, we have no defaults set, so users can pick any color and size right away from the product page. If you want a certain variation already selected when a user visits the product page, you can set those. This also enables the Add to Cart button to appear automatically on variable product pages. You can only set defaults after at least one variation has been created. Enabled – Enable or disable the variation. Virtual (required)– Check this off because rentals typically are not shipped. This causes shipping settings to be removed. Regular Price (required) – Set the price for this variation. Sale Price (optional) – Set a price for this variation when on sale. Manage Stock (required) – Tick the box to manage stock at the variation level. Stock Quantity (required) – Shows if Manage Stock is selected. Input the quantity. Stock for the specific variation, or left blank to use the product’s stock settings. Dimensions (required)– Height, width and length for the variation, or left blank to use the product’s dimensions. This is good information for customers to know. Click the blue image placeholder (screenshot). Select the image you wish to use. Save variable settings and proceed to fill out product information like you normally would. Stuck? Reach out to us directly at support@loveofparties.com!